Mayan Queen Video Slot Guide & Review - Casino Answers! Mayan Queen is a 5-reel, 25-line video slot developed by Realtime Gaming, featuring an expanding wild symbol, scatter wins, a free spins feature and a progressive jackpot. 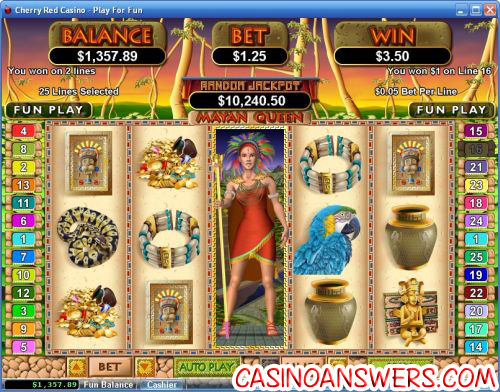 You can play the Mayan Queen Real-Series Video Slot casino game at USA-friendly casinos Slotastic Casino and Rushmore Casino. Bets on the Mayan Queen slot game are $0.01, $0.02, $0.03, $0.04, $0.05, $0.06, $0.07, $0.08, $0.09, $0.10, $0.25, $0.50, $1, $2.50 and $5 per line. You can play from 1-25 paylines per spin on the Mayan Queen video slot. Mayan Queen is a penny slot. You can play anywhere from $0.01 per spin up to $125 per spin. If you want to manually stop the reels, use the “Stop” button to activate the skill stop feature. To play the Mayan Queen video slot, hit the “Spin” button. The wild substitute symbol on Mayan Queen is the Queen symbol. It only appears on the third reel and substitutes for all other symbols including the Scattered Emerald symbol. When the Queen appears on the third reel, she will expand to cover the entire reel before payouts are made. She will also double all of your winnings. The Queen will count once on her reel as a scatter symbol. The highest paying symbol on the Mayan Queen video slot game is the Temple symbol. On its own, 5 Temple symbols will pay out an amazing 15,000 coin top fixed jackpot. When coupled with the Queen symbol, you can win 30,000 coins! That would be enough for most video slots, but there’s more here. The Jaguar symbol is another high payout at up to 2500 coins (or 5000 when the Queen appears on the third reel) and the Treasure symbol will pay out 1000 coins (and can be doubled to 2000 coins as well). Try to win one of these large payouts when playing the Mayan Queen slot machine at Slotastic Casino! The scatter symbol on the Mayan Queen online slot is the Emerald symbol. Scatter payouts are 1X, 2X, 50X or 500X your total bet for 2, 3, 4 or 5 scatter symbols. The Queen symbol can substitute for the Scattered Emerald symbol. When 3 Emerald scatter symbols appear anywhere on the reels, you win 6 free spins with the Queen covering reel 3 for the entire free spins feature. The free spins feature can be re-triggered. Free games are played at the paylines and bet of the triggering game. Mayan Queen features a randomly triggered progressive jackpot, which at the time of this writing is at $10,305 and ready to be won. The progressive jackpot is won at random; hence no winning combination is required to win it. Progressive Jackpot wins are added to other wins. Random Jackpot contribution is no more than 1.5% of total Return to Player. 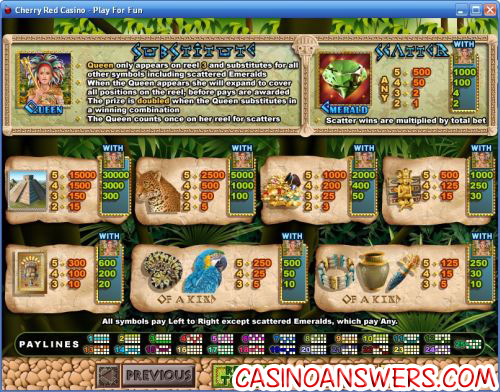 Hit the “Autoplay” button to open the autoplay settings on the Mayan Queen slot game. You will be able to set the number of spins, set it to stop when the jackpot is won, stop if a win exceeds or equals (any amount you input), stop on any win, stop if your balance increases/decreases by any amount you input and stop once the feature is triggered. You can stop Mayan Queen’s autoplay mode using the “Stop Auto” button. To speed up the gameplay, simply hit the “Turbo Play” button in the autoplay mode. Mayan Queen definitely brings the goods with several high payouts and thanks to the expanding wild multiplier, those already generous payouts can be doubled. All of this is not to mention the progressive jackpot, which is currently over five figures as this review is being written. To play the Mayan Queen video slot, sign up and deposit today at Slotastic Casino! Can players who are based in the USA play the Mayan Queen slot for real money? American players can play the Mayan Queen online slot game for real money at many RTG online casinos, including Slotastic Casino and Rushmore Casino. How do I win the Mayan Queen Progressive Jackpot? To win the Mayan Queen progressive jackpot, all you have to do is spin to win! The jackpot is random, so you don’t need to have a winning spin to win the jackpot. To better your odds of taking this juicy jackpot home, increase your bet per line. Is there a Flash game I can play for free of the Mayan Queen slot machine? Unfortunately, RTG casinos such as Slotastic Flash Casino and Rushmore Flash Casino only offer a limited number of slots in their Instant Play casinos. For a similarly themed video slot you can play at the RTG Flash casinos, please read our Aztec’s Treasure Video Slot Review. Where was that Mayan Queen flash game slot?